With 2017 coming to an end soon, we’re wrapping up our Flight of the Mothership 2017 Tour with 3 final dates. The first event is two nights at Eastwest Studios, Studio 2 in Hollywood CA on 11/15 and 11/16. On the first evening, we will have a renowned Brazilian Bossa Nova band featuring Carla Hassett recording a few tracks for the event. On the second evening, we will have a larger orchestra ensemble featuring upcoming composer, Allison Piccioni and an original piece of classical music she has written. 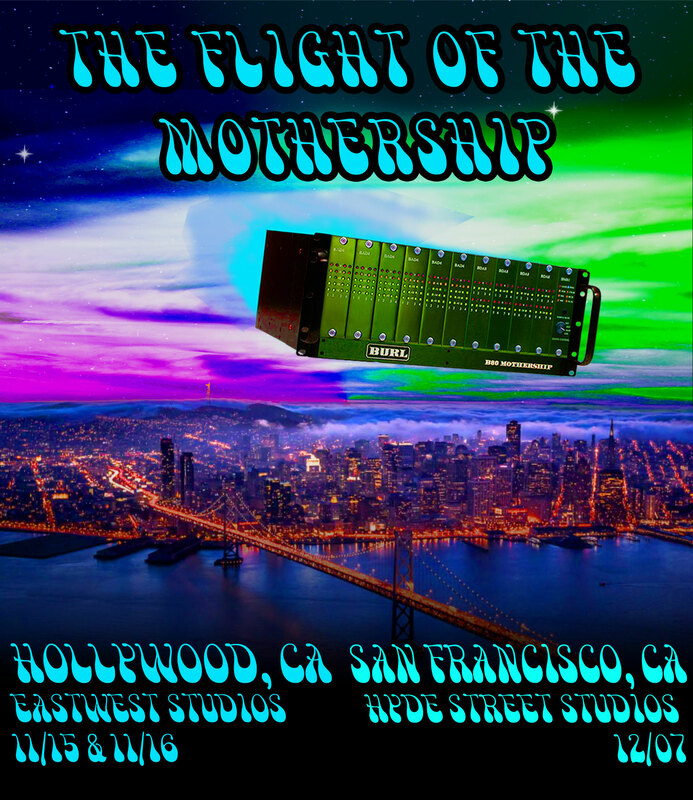 Like our other Flight of the Mothership events, we will be showcasing the B80 MOTHERSHIP. We will be putting it to the test as we invite our guests to come and A/B the MOTHERSHIP versus other industry standard converters. The second event will be on 12/07 in our neck of the woods in San Francisco, CA at legendary Hyde Street Studios! BURL Artist and legendary Latin Grammy nominated producer, Greg Landau will join us for a night of music and recording with the group Carne Cruda. 6PM – The event will begin with an A/B listening session of Carla Hassett’s Bossa Nova recording using the B80 MOTHERSHIP vs. the Avid HDIO. 7PM – Drinks, Snacks and Q&A with Rich Williams. 8PM – A/B listening session continues with a LIVE performance with Carla Hassett and her band. 6PM – The event will begin with an A/B listening session of Allison Piccioni’s original score using the B80 MOTHERSHIP vs. the Avid HDIO. 8PM – A/B listening session continues.